Bird Recognition books described the song thrush as a winter singer ‘except in bad weather’ with ‘full song’, March-July. By contrast, the mistle thrush (Turdus viscivorus, ‘devourer of mistletoe’), almost three inches longer than its brown, less boldly spotted, more tuneful cousin, sings irregularly from mid-November. There is ‘song and display’, the book adds, from the ‘longest night’ to June. Moreover, as its colloquial name ‘stormcock’ shows, it chooses to sing from a treetop whatever the weather. 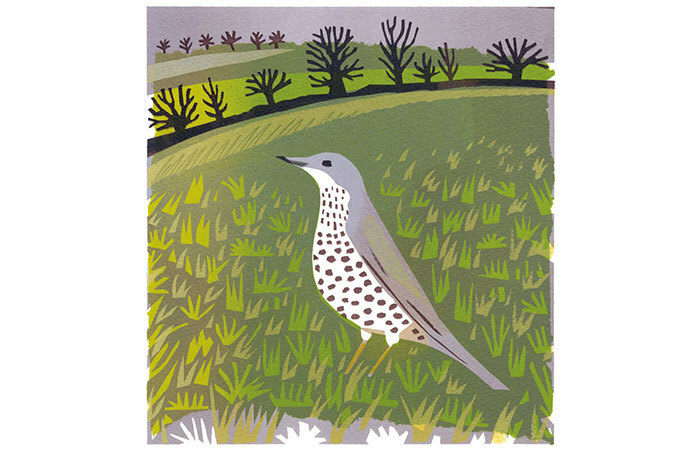 For that reason, in Thomas Hardy’s popular Christmas poem, The Darkling Thrush, – although the bird is described as ‘small’ and its singing as ‘carolings’ – it is generally identified as a mistle thrush. The 17th-century polymath Sir Thomas Browne gave the mistle thrush its name. Like the song thrush, it is partial to worms and will bash snails on an anvil-acting stone to break the shells. Toxic to humans, mistletoe berries were an ingredient of trappers’ bird lime; thus they were often the bird’s ironic downfall as much as its sustenance. The untidy nest can appear in odd places, such as a traffic light in Beeston, Leeds, which made news in 2010. Usually it is a wary country bird, only seeking town in harsh weather, but autumn flocks can briefly alight in city parks. With winter approaching, it pairs again.